Description of the set including any distinguishing factors of various pieces. Please note that the insurance price recommendation, in most cases, is not the same price as the purchase price. Therefore the insurance valuation for the chess set purchase should generally allow for the cost of replacing the chess set from general chess stores. The insurance valuation will therefore be, in most cases, a price for the chess set which is substantially higher than the purchase price. The document comes on official ChessBaron headed paper showing our established company logo and address. 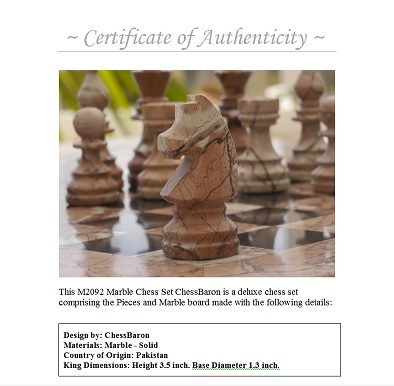 Since records have always been maintained of each chess item procured by our customers, enquiries can always be made in the future about a chess set or it's authentication document via. the address on the document and on our chess set website.